Germany, Berlin (BBN)-Barcelona claimed their third Champions League in six years as the brilliance of their attacking trident proved too much for the brave challenge of Juventus in Berlin’s Olympic Stadium. In a thrilling spectacle, and with both Barcelona and Juventus attempting to claim a treble after winning domestic league and cup competitions, it was Luis Enrique’s side that eventually came out on top, reports BBC. Barcelona started as if they would romp to a comfortable victory when Ivan Rakitic capped the sort of passing move that has become their symbol to put them ahead inside five minutes. Juventus, always a danger after ending notions of an “El Clasico” final by beating Real Madrid in the last four, showed fierce resilience and with veteran keeper Gianluigi Buffon defiant, held on for Alvaro Morata to scramble an equaliser before the hour. Redemption time arrived for Suarez, the player who ended last summer’s World Cup in disgrace after biting Italy’s Juventus defender Giorgio Chiellini, in the 68th minute when he showed a predator’s touch to pounce after Buffon failed to hold Lionel Messi’s shot. Juventus could not mount another recovery and Brazil superstar Neymar wrapped up the win in what he described as the biggest match of his life with the final kick of the game. For all Barcelona’s brilliance, built around Neymar, Messi and Suarez, Juventus ran them every inch of a compelling encounter and were left with a hard luck story to tell as they were convinced they should have had a penalty when Paul Pogba tangled with Dani Alves seconds before Suarez scored. In the end, however, Barcelona simply had that extra touch of fantasy that places them above the rest of Europe and Enrique’s side can put their names alongside those who brought the giant trophy back to Catalonia as they claimed their fifth triumph in the tournament. As well as Suarez’s happier storyline, there were other sub-plots too as Neymar made up for his own World Cup heartbreak last summer, when he was injured before their 7-1 loss to Germany in the semi-final. And for 35-year-old Barcelona legend Xavi, he was able to say farewell after a glittering career with another Champions League win before a move to Al Sadd in Qatar. 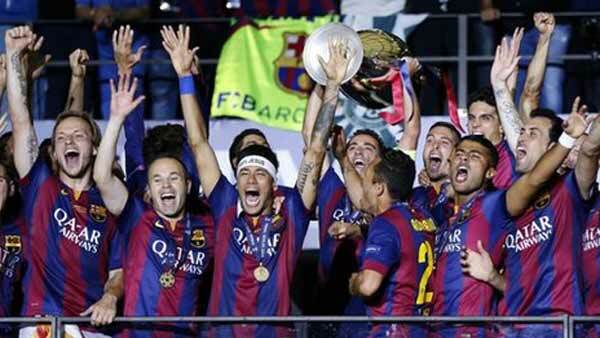 It was the perfect ending as Andres Iniesta handed him the armband. This was a wonderful antidote to the sour taste left after a week of corruption allegations levelled at Fifa, the world game’s governing body. Barcelona’s opening goal could be offered up as an example of everything the club’s approach to the game is based on – and actually came after two early moments that hinted at vulnerability at the back as Juventus pressed. Nine outfield players were involved but the decisive contributions came when Neymar played in Iniesta, who picked a perfect pass in a packed penalty box for Rakitic to beat Buffon. Buffon has rightly assumed legendary status at Juventus and proved he is still among the elite bracket of goalkeepers as Barcelona pressed for a second, showing superb reflexes to deny Alves after originally being wrong-footed. Juventus were left with little option other than to cling on and hope to fashion a rare opportunity and they lifted the spirits of their huge banks of supporters as Morata and Claudio Marchisio threatened with efforts that were narrowly off target. It was impossible, however, to keep Barcelona at bay with Suarez facing a cluster of Juventus defenders in retreat before shooting inches wide then forcing a fine save from Buffon. The pattern continued after the restart with Buffon again the man to thwart Suarez low at his near post before a thrilling interchange between Neymar, Suarez and Messi ended with the Argentine wastefully shooting high and wide. Those missed chances came at a price, an expensive one, as Juventus broke the shackles to draw level after 55 minutes. For all the appreciation heaped upon Barcelona’s artists, it was a brilliant piece of initiative from Juventus that created the goal. Marchisio’s backheel released Stephan Lichtsteiner and when Marc-Andre Ter Stegen could only turn away Carlos Tevez’s shot, Morata was on hand to slide in the finish. Suddenly, the momentum was all with Juventus but they were left nursing a sense of injustice after a minute of action that saw the final swing back in Barcelona’s favour. Juventus appealed in vain for a penalty after Pogba was wrestled to the ground by Alves but Barcelona broke away and when Buffon failed to hold Messi’s shot, Suarez was in position to drill high into the net before a joyous celebration. Neymar thought he had added a third but saw his effort ruled out because he headed the ball on to his own arm before it evaded the grasp of the diving Buffon. He found solace in the dying seconds when another Barcelona counter ended with an emphatic finish past Buffon.